Saudi authorities are investigating a construction crane collapse that killed at least 107 people and wounded 238 others during a storm at Mecca’s Grand Mosque, pledging that the annual hajj pilgrimage would go ahead. As world leaders offered condolences, the governor of Mecca region, Prince Khaled al-Faisal, ordered an investigation into the tragic accident that occurred as worshipers gathered for prayers. The Saudi Press Agency quoted a spokesperson for the two holy mosques as saying that the crane was brought down by strong wind and heavy rain. Abdel Aziz Naqoor, who said he works at the mosque, told the AFP news agency that he saw the massive construction crane fall after being hit by the storm. 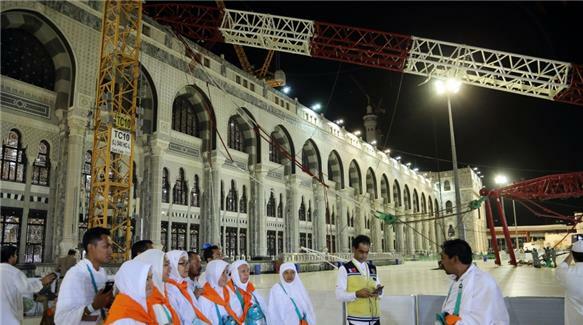 “If it weren’t for Al-Tawaf bridge the injuries and deaths would have been worse,” he said, referring to a covered walkway that surrounds the holy Kaaba, which broke the crane’s fall. General Suleiman al-Amr, director-general of the Civil Defence Authority, told Al Ikhbariya television that strong wind and rains had uprooted trees and rocked cranes in the area. Irfan al-Alawi, co-founder of the Mecca-based Islamic Heritage Research Foundation, suggested that authorities were negligent by having a series of cranes overlooking the mosque. Pictures circulating on social media showed pilgrims in bloodied robes and debris from a part of the crane that appeared to have crashed through a ceiling.